I’ll admit to being a but flustered interviewing Dr. Alice P. Green. I would get to once again see the woman who granted me my first college internship and who is a leading activist for justice in Upstate NY. Being dazzled and flustered is why I have no photograph of the legendary activist. But photos aside, I am honored that this legal and activist legend allowed me to interview her. As a journalist said when I told him about the interview, “She’s a giant.” And Dr. Alice Green is a force in our community. Everything I do is based on my early life and my history, particularly as an African American woman. Dr. Alice Green’s life history is representative of the struggles of the African-American community in our country. Her great grandmother was enslaved, and her paternal grandmother was a brilliant sharecropper who ‘knew how to survive.’ Dr. Green’s family lived through the Jim Crow era, convict-leaseing in the Reconstruction era, which she describes as worse than enslavement, since people were literally worked to death, whereas when people were treated as property, they often were not worked to the point of dying. Mass incarceration is another form of enslavement and control of black bodies. The history of the struggles of African-American people forms the basis of Alice Green’s involvement in these issues. The Center for Law and Justice (CFLJ), founded by Dr. Green in 1985, has been at the forefront in our Capital Region on criminal justice reform. Achieving justice in this area has been difficult- Dr. Green told me that initially, many found the Center’s work ‘weird’ and/or ‘radical.’ Working for prisoner’s rights was not popular. But by enduring and focusing on the work, the CFLJ is now at the table, affecting policy, which has been the goal all along. By having a seat at the table, CFLJ now affects policy in key areas like community policing, the LEAD diversion project, and rephrasing the conversation on the war on drugs as a public health concern. Dr. Alice Green is proudest that The Center still speaks for the people they work with and on behalf of. I asked Dr. Green what she thinks is the issue most strongly affecting our country, and she replied that it is still racism. The country does not understand the nature of institutionalized racism. If affects everything that we do. She went on to note that racism is evident in many areas of common life: housing, employment, certainly the criminal justice system itself. Criminal justice, and the mass incarceration of millions of black people over multiple generations, affects individual families and entire communities. In our own community, a controversial case involving three young women (colloquially known as the UAlbany Bus Trial) has been divisive and revealing. Dr. Green, who was involved in the case from the beginning, and sat during most of the trial, feels that this case is about the subtle ways that racism is enacted and experienced. For her, it was revealing in many ways. Did this case even need to be prosecuted? For many of us it also brings to light how quick people are to use social media to condemn and vilify, and also to discount that racism exists. I asked Dr. Green about this case because it has made me rethink my own assumptions about innocence or guilt and how the media can frame a story. For Dr. Alice Green, the trial and actions leading up to it could and should have been a teaching moment for the community. The political climate being what it is, both Dr. Green and the CFLJ will likely have more work to do. As she pointed out, even though much is worked on at the local/state level, federal funding will affect various programs. The Attorney General of the United States is considering expanding draconian drug laws, rather than move in more progressive direction. Do what it is you can do no matter the level. It all adds up. You have to get the message out there and be a force for change. She does not lose hope because the people she works with and for pump her up. When Dr. Alice Green walks down the street or attends a rally or meeting, she often runs into formally incarcerated folks who come up to her and are involved on the issues. She told me about the work of Just Leadership, formally incarcerated activists who work on issues like speedy trial, re-entry, raise the age, and other criminal justice matters. This kind of grassroots resistance and organizing is empowering to her as well. She also likes the Green Party because she feels there is no compromising on principle. Dr. Green started a program for writers up in the Adirondacks. She was inspired both by having a retreat for writers of color, but also introducing more people of color to this community. The program has grown and evolved, and has been facilitated in the past through joint efforts of Medgar Evers College and SUNY Plattsburgh‘s writing institutes. I can tell this is a place of pride for Dr. Green since she described how the program has been beneficial for participants but that residents get involved in the Adirondack community, including with local libraries. These spaces of collaboration and art are some of the best our region has to offer. This year the retreat continues and Dr. Green hopes to continue community readings produced by retreat writers. As someone who loves Albany, the Capital Region and Upstate NY in general, I always want to hear what a leader like Alice Green thinks about improving our community. We’re a very segregated community and have not made enough strides to relating to each other. Racism prevents us from mixing with each other, and we don’t live near each other. Additionally, many people don’t see homelessness or poverty as issues but they definitely are issues in our area. Dr. Green and I had an interesting side conversation about education, and how without commitment to our city schools, we won’t see the kinds of changes that are necessary. 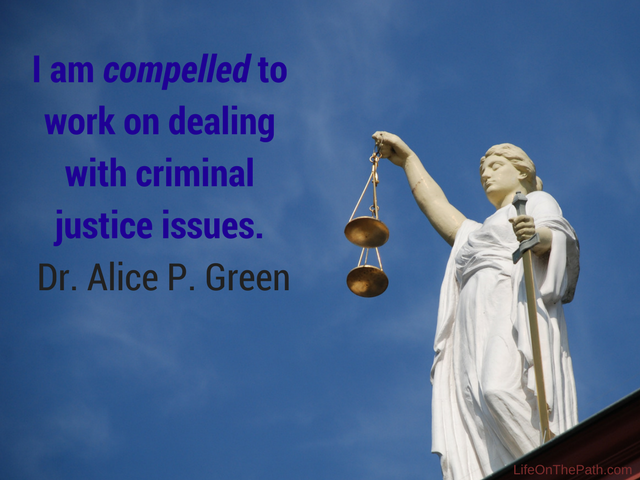 Dr. Alice Green and CFLJ are committed to social equity movements for those very reasons. Although we only touched upon it briefly, we did talk a bit about spirituality. I believe the current political climate shows a poverty of spirt and unwillingness to see our interconnectedness. My spirituality tells me that I have to respect and love and be part of a community of all kinds of people. This is a lesson we can all heed. If you are interested, the Center for Law and Justice has a wealth of volunteer opportunities available. Lawyers, grant writers, experts in a variety of fields are always welcome.